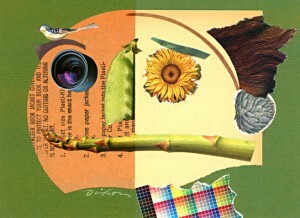 The Collage Miniaturist welcomes you to this log of creative thoughts and images. He encourages you to visit frequently, to make comments, and, if you see a collage miniature that pleases you, to purchase it for a collection. From a solid foundation in design, John Andrew Dixon creates intricate collage artworks full of color and visual allusions. By repurposing discarded paper and other devalued remnants of everyday culture, he uses his aesthetic sensitivity to produce enduring artworks that exemplify his refined intuitive process and exceptional artisanship. Dense with layers of ingredients, his work captures a visual balance that is rich with spatial harmony (color, shape, texture, rhythm) and emotional impressions (surprise, intrigue, beauty, joy). By commission, Dixon also offers what he calls “legacy collage.” Using provided artifacts from travels, career, or a lifetime, he creates archival works of art that provide patrons a way to preserve and display significant elements from their documents and clippings. These works make ideal gifts to esteemed individuals or their heirs. With his illustrative abilities and mixed media skills, Dixon can include creations from his own hand in the commissioned piece. He avoids using ink-jet reproductions in his work. To understand collage and its history as an art form, Dixon has studied the work of Schwitters, Höch, Hausmann, Cornell, Rauschenberg, Hamilton, Otnes, and Kolář, as well as contemporary practitioners. Dixon earned a degree in Graphic Design from the University of Cincinnati’s College of Design, Art, Architecture, and Planning (DAAP). After working in Brussels and Chicago, teaching design fundamentals at Wright State University in Ohio, and a 40-year career as an award-winning designer and illustrator, Dixon brings a mature focus to his work in mixed media. As a fine artist and exhibitor, he is a regular blogger on the topic of collage and is active in ongoing joint ventures among regional creatives. In 2017, he was named an adjudicated member of the Kentucky Crafted Program administered by the Kentucky Arts Council. Working from a studio and gallery in the heart of downtown Danville, Dixon and his wife and partner, Dana, offer visual communication solutions to institutions and entrepreneurs. His current work is displayed at Dixon Design and available by appointment. 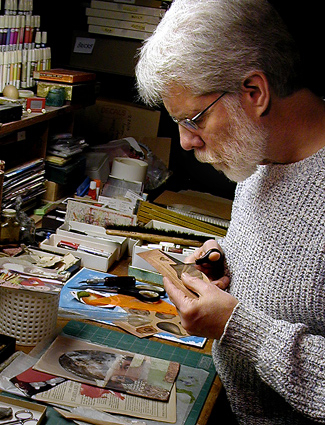 Many of his collage miniatures can be purchased directly from this site. As a local leader, Dixon has volunteered on many boards and was presented the David Bell Birney Hope Award for outstanding community service in 2010. An avid bicyclist, he contributes his time and talent to local efforts on behalf of bicyclist-pedestrian safety and accommodations. He was appointed to the Kentucky Bicycle and Bikeway Commission as an adviser to the Transportation Cabinet by Governor Fletcher and was named to the Honorable Order of Kentucky Colonels. Dixon and his six siblings grew up in rural Ohio. Inspired by their parents’ values, each migrated to Central Kentucky to reside in proximity, having made a mutual pledge to share a quality of life as a close-knit extended family. For over three decades, a remote farm retreat in the Knobs of Casey County has been their unifying focus — a legacy of stewardship to new generations.